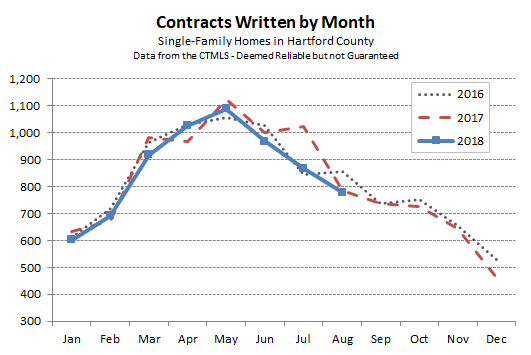 Hartford County finished August with 779 single-family contracts, slightly behind the August 2017 total of 785 deals. It continues to be a strong year for the county, with the total deal count only off last year’s total by about 3.4%. Real estate markets took the traditional late summer step back in August. The pool of buyers trying to time the school year cycle typically phase out of the market at about this time of the year. Since it usually takes 45 – 60 days for a deal to close, putting a home under contract in August is unlikely to result in a move-in date before early September … after the school year has begun. From now through March, buyers and sellers are folks who choosing to move for reasons that not related to schools. Downsizing continues to be a big trend in the region as the population ages. Work relocations are common because the Hartford area is a commercial hub. We are still seeing people buying their first home as they take advantage of the stable economy and the attractive mortgage interest rates. Town-by-town performance is always interesting to track, and at this time of the year the numbers tend to settle because there is a meaningful amount of data. 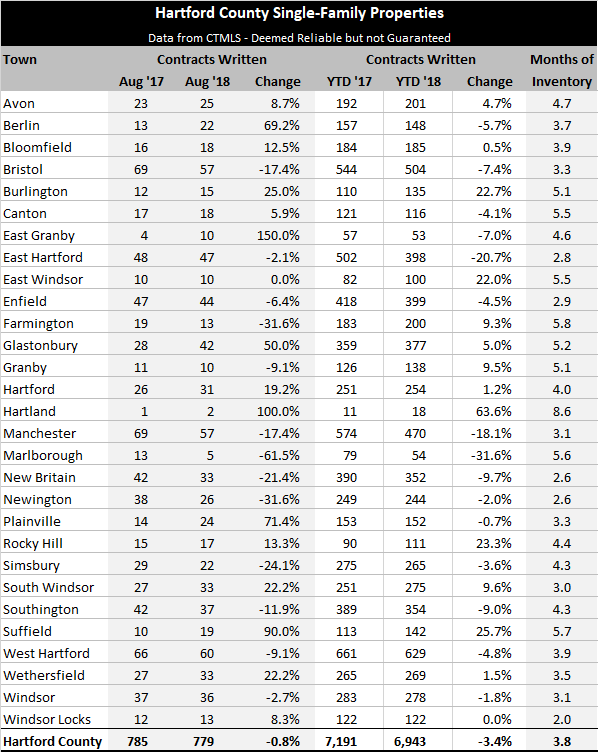 Focusing on the year-to-date column below, East Hartford and Manchester are the two municipalities showing the largest drop in the number of deals. Both are trailing 2017 by 104 contracts as of the end of August. In East Hartford, the City had a very slow run in June and July. Those two months accounted for 57 deals of underperformance, which is more than half of the total for the year. Inventory levels are on the low side, at 2.8 months overall, but are no longer so low that buyers don’t have any homes to consider purchasing. Manchester’s underperformance is actually more about last year than this year. The number of monthly deals this year has followed normal seasonal patterns, though it has been slightly below each corresponding month from last year. The main difference in the overall total was caused by surprisingly high deal counts in January, March, and April 2017. This year has been more of a typical year for Manchester. Suffield has shown the largest increase in deals over 2017, with 29 more contracts leading to 25.7% more activity. As a smaller town, Suffield’s monthly data is more erratic than the East Hartford or Manchester. Consistent monthly deal counts during the summer of 2018 created the surplus deals after a hit-or-miss summer in 2017. There could still be some surprises between now and the end of the year. Whether there are or not, 2018 is very likely to be another strong year for the local real estate markets.